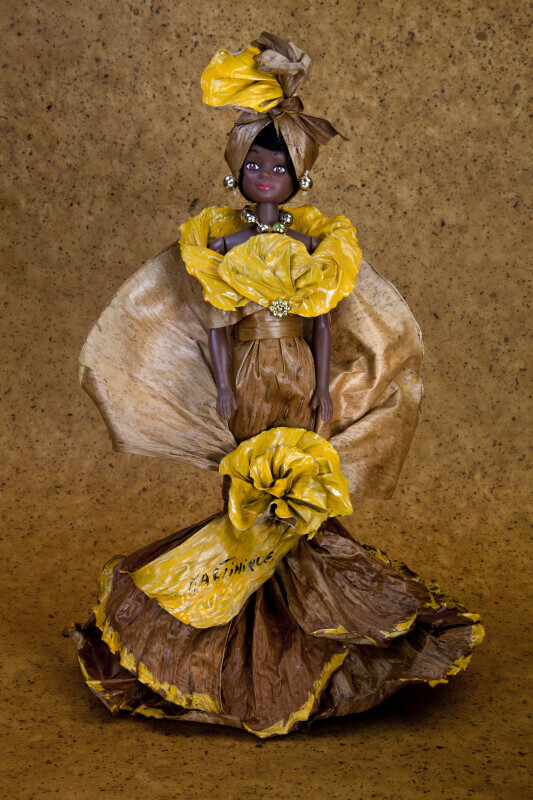 Plastic doll from Martinique with clothing hand made from banana leaves. Her dress includes a large collar that is painted yellow and a fitted dress that flares at the knees. She has an elaborate African-style head scarf on her head. She is wearing gold plastic beads on her necklace and earrings. The doll is standing on wood base. Tag: "Martinique" is painted on the large bow near her knees. The figure stands 13 inches (33 cm) tall. WARNING: You are about to download a 65.9 MB TIFF!